Fox News Channel, the most-watched cable news network every quarter since 2002, recently released a major update to its Roku channel in the US. Finally available is a live stream of the cable channel, plus full episodes of popular shows like "Hannity," "The Five," and "The Ingraham Angle." Similarly, Fox Business Network has been updated with a live stream and full episodes of popular shows. Unfortunately, many fans of Fox News and Fox Business will be disappointed to learn that these features are available only to subscribers of participating pay TV service providers. Those unable to authenticate Fox News through a pay TV service will still be able to watch scores of videos, including clips from 30 Fox News shows, breaking news, and video updates covering the topics of Politics, U.S., Opinion, Entertainment, Tech, Science, Health, Travel, Lifestyle, World, and Sports. Fox Business offers unlocked clips from 14 shows along with videos covering Investing, Personal Finance, Small Business, Technology, Economy, and several other topics. Pay TV services that allow their subscribers to authenticate Fox News Channel and Fox Business Network include major cable and satellite providers like AT&T Uverse, Comcast XFINITY, Cox, DIRECTV, and Verizon Fios, along with dozens of regional and municipal cable systems. Several streaming TV services are also represented, including Playstation VUE, Hulu, and YouTube TV. Gone from Fox News Channel is the audio broadcast "Fox News Talk," which features talk shows from Brian Kilmeade, Todd Starnes, Tom Shillue, and others, along with new at the top and bottom of each hour. Listeners can still Fox News Talk on Roku by searching on TuneIn Radio. 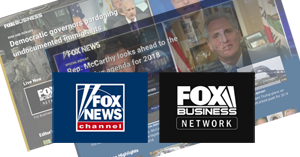 More information on these channels, including instructions for authenticating the channels and checking to see whether your TV service provider allows authentication, can be found on our Fox News Channel page and Fox Business Network page.